I hope I'm not duplicating an existing topic. I'm starting this thread more because of questions about the role of patience in dealing with horses than because I feel I have answers. Everyone agrees when asked that patience is important. And most of us struggle with it to some degree. The reason I wanted to get more input on this is because almost everything I've read and every conversation I've had about horse-human interaction recently was somehow related to patience, or more likely to the lack of it. It's almost always the humans, not the horses, that seem to lack patience. I'm a big offender in all areas of life myself and I'm sometimes wondering if anything except getting older is making me more patient. I guess the more I care about someone (person or animal) the more patient I want to be, but I don't necessarily succeed. Here's just a couple of examples: People might be impatient because they want to control, be successful (in their own or someone else's eyes), have problems with impulse control in general, are in a bad mood, are in a great mood etc. My hope is, that if we can find a way to learn patience, even learn to enjoy being patient (at peace?) we and our horses will benefit hugely, maybe even more than if we have all the knowledge to do things right. I've heard people say that training horses will teach us how to be patient and I guess that's true to some degree. On the other hand, I know that my horse is paying a high price if she is the only one who is helping me work on this. I'm just brainstorming, any input, examples, thoughts, experiences are appreciated. Ooh, lovely start to a new thread, Birgit! Thank you. I think this is hugely important. So, having a passive "dream time" day has evoked thoughts about patience, which I don't have lots of, generally, but am bit by bit learning more about the beauty of as I get older. I love words, and I just looked up the etymology of patience, which springs from Latin for "to suffer, to endure" from an earlier Proto Indo European root for "pain." This is usually EXACTLY how I experience patience! I was thinking about that flash of impatience that struck when I was trying to get Circe to stop spinning like a blond fuzzy top to make sure that she would be ready when the next treat appeared the other day. I had a moment of frustration, verging on anger, with her. And then I had an image you, Karen, in your videos working with Tam -- and your descriptions of the targeting specific muscles. I know you tend to say that you're not methodical, but I think that in many ways you are extremely so. It may not be a linear method, but it is so generously patient, without that sense of suffering underneath it. The joy of patience -- it becomes something else then, I guess -- a creative commitment to process where you dive into the poetry of the precise moment and experience so it isn't really "waiting" for anything, but instead exploring. From the outside, it looks very Zen, and is so inspiring. Anyway, it struck me today how often, in spite of my best efforts not to go there, I have gotten impatient with Stardust or Circe in the time we've been together. As I pull the "why" of this apart, I realize that it has to do with having an agenda. (We "should" be getting to x, y, or z, by now...or I want to be ready to ride or ride in a particular way...or we should have the ground manners thing down cold by now, etc.) This isn't a brilliant insight, I know (or at least not a unique one! ), but the part of it that struck me was how frequently it was coupled with a sense of external voices that I would hear in my head. It's ego, or pride, or insecurity, and comes from being concerned with what others think and say about what I should be accomplishing and when. (And these are imaginary judges as often as they are real ones.) I'm realizing that when I can shut those voices up, I actually am genuinely enjoying the leisure, and it's what I'm hungering for, often, in my experiences with my horses. On the really good days, it becomes "dream time" itself -- when we together step outside of the conscious, linear, "tempus fugit" sense of time into what feels to me like what I imagine as/call mythic time. (And is where I believe horses spend much of their mind time.) Then there is release, that right brain stuff that the neuroanatomist I quoted above was talking about -- it is present, right here, right now and at the same time is huge and universal. I think that's part of why I'm so deliriously excited about this forum right now, and so (apparently!) unable to pull myself away from the thoughrs and ideas and energies here. It feels like I've stepped into a delicious stream of collective consciousness and unconsciousness that is finally helping me find ways to get past my own crap and open myself to the experience that I really want -- that connection, that "outside of time" magical openness that is so relaxing and energizing at the same time. And, I've been thinking about your thoughts, Sue, about unschooling (love the "unemployment training," BTW!!!!). This obsession this week with this way of approaching horses has taken precedence to so many other things -- I have been "Leigh-directed" rather than "responsibility-directed" and haven't had the strength to resist the lure. (Or, if I'm honest, other than the occasional pang of guilt, the desire.) The reality of those responsibilities are going to come crashing in here in the next couple of days as I scramble to get done that which I ought to have done (this is where the quickness factor comes in handy -- a lifetime spent goofing off and being fast enough to pull things together at the last minute to I don't fall on my face or get caught!). But, this dream time -- today, in my fatigue, the hours that I've spent with my horses over the last week, and the time I've spent reading all of these amazing ideas from these amazing people on this forum has been a gift. And I'm realizing that when I take a vacation from my responsibilities in this way, I usually find some things that actually connect back to what I'm "supposed" to be focusing on. Don't know if this is serendipity, or just being opened to and opened by connections (or, I suppose, a superb effort at rationalization!) but it consistently happens. Hmmmm...I'm not sure how depressed I should be to realize that a year and a half later I'm still having the same internal conversation regularly! I had a very leisurely session with Circe today -- very soft, very joyful in a diffuse, quiet, centered way -- with lots of very soft touching and a willingness to invite rather than tell (which I still wrestle with far more than I'd like to admit). It was patient without the pain underneath -- and I think the key was about being really in the moment and savoring the physical and emotional sensations and just being -- dream time, actually is still a good definition of it for me. No one else was there -- just me and Circe in the arena in a moment that felt very atemporal with the skies coming down into a half light because of the coming storm. No one else was there literally, but more importantly, no one else was there even imaginally to interfere with how we were experiencing and imagining the experience. No real or imagined critics telling me that we needed to get somewhere. For me, that aloneness and horse/Leigh togetherness come hand in hand -- if I let other people into my experience -- either live or in Memorex -- that's when my patience is most likely to flee because I start assuming the "gotta make it happen" goal stuff and the monkey brain kicks in. I got impatient after just a few hours and wanted to see if anyone had responded to this thread and my impatience was richly rewarded. Thanks, what you shared resonated with some much I have been thinking and feeling. It was very good to read. The quality of suffering that can turn to leisure/enjoyment, enjoying the journey instead of just focusing on the goal (but not completely forgetting the goal). It's ego, or pride, or insecurity, and comes from being concerned with what others think and say about what I should be accomplishing and when. (And these are imaginary judges as often as they are real ones.) I'm realizing that when I can shut those voices up, I actually am genuinely enjoying the leisure, and it's what I'm hungering for, often, in my experiences with my horses. I think it's very important to remember the imaginary judges because they are often the far more dangerous ones. It's sometimes that I want to anticipate what someone else might think so I don't feel so vulnerable to criticism, insecurity or pride, as you said. It's hard not to worry about what others think of us, because we all sometimes have critical thoughts about others, even when we are polite enough not to share them. I've experienced that also. It's harder to maintain what you called leisure, joyful patience, but I think we have the desire to share it in us, and when we do so successfully it's contagious, it can even spread like wildfire sometimes. To me that's kind of like lying on the beach all day when others around me have to work, or like being wealthy and using it all for myself, in other words it feels like I'm wasting my potential to be useful to others. So is it possible to have too much patience? For me patience and ego are interlinked, especially when it comes to dealing with horses. The happiest and healthiest horse in the world, with which you can communicate better then with most humans? It's also about walking fast to get from A to B... or just walking and enjoying the walk and the scenery... The first way, the walk will take long, the second way, the walk ends to soon. For me patience is something that I donÂ´t have. At all. However, when other people see me interacting with horses, they often get the impression that I was very patient. Actually I think that this is not the case and I assume that there are two reasons why I can seem to be patient while actually I am not. (1) ItÂ´s not that I had no goals or that I could put them aside. I simply have other goals - for me itÂ´s mostly not the specific exercise that matters but the horseÂ´s attitude. I want them to be strong and feel that they are in control, and I have no idea how I could rush them into that. So when we are doing things slowly, this is absolutely not because I am good at this suffering kind of patience that Leigh described so beautifully, but because by doing exactly what the horse needs, I AM getting closer to my main goal: the horse being in control and becoming stronger. (2) I am in the very lucky situation to have three horses who are all very motivated to train with me. So even if I felt that I desperately needed a front crunch right now, I would not have to rush Pia into learning it, because I could simply ask Titum and he would do one (or five) and be more than happy about it. So for me it does not matter that Summy still does not lie down on cue, that Titum still moves like a little princess on tiptoes instead of pushing from behind most of the time and that Pia still does not do the travers. I can simply ask another horse, if I want that exercise so badly. In that way I can work with every single horse on the things he really likes and get the rest from the others. And by the way, for me having exercise goals does not feel like my ego kicking in at all (because my ego is strongly active all the time anyway ) but more like getting into a certain kind of play mode. Like Leigh said, not having those goals at all is probably not going to be the ultimate solution either, because then itÂ´s very likely that you become uninterested. So for us itÂ´s having them, but always keeping in mind that they are only a tool, a tiny step towards our main goal of having a powerful and self-confident horse, and itÂ´s just no use to compromise the main goal for the sake of a tiny step towards it. If this was necessary in a certain situation (like if I wanted Titum to finally do a good piaffe), we just leave that step out for now and take another route instead. For me patience is something that I donÂ´t have. Romy you made me laugh out loud! More later but just wanted to respond to that. Guilty as charged! I have had such trouble with being patient with my horses sometimes. I think it is what Josepha said. Ego. Pride. However, when I was teaching Jackson to sit down on the hay, I really learned what patience is. It is not so much how I feel, but rather making sure I go no faster than my horse wants to go. Normally when I work with horses, by personality is such that I miss the little things they are saying to me. For some reason, when I was working on the sit, I was opened to a whole new level of communication! I imagine that this was because there was no way I was going to be able to "force" Jackson to sit down, so I had to read him very carefully. He taught me about what he wanted! And it has been hugely rewarding! @Leigh: Great! I think there is nothing more healthy than a good laugh. And now I am curious about the "more later". I imagine that this was because there was no way I was going to be able to "force" Jackson to sit down, so I had to read him very carefully. He taught me about what he wanted! And it has been hugely rewarding! Ivy, if you liked the experience of not being able to force Jackson to do something or go faster than he wants to and at the same time you feel that in other situations you still do it, then what about making sure that you CANÂ´T? For example by simply not bringing a whip with you or establishing some rules for yourself, like "I never ask more than twice if the horse does not react" or "I never increase the intensity of asking above a level where I am sure that the horse understood what I meant" or "I never walk up to the horse but only play with him when he comes". Generally I am not too fond of strict rules, but I find them to be helpful at times, at least temporarily, especially when you know that you could get into a situation where you lose track of what it is that you actually wanted because in the heat of the moment you tend to get caught in the little things and in that way forget about your more general goals. That is great advice! I am doing better, though. When I went out to make the last video I was very careful not to push. The only time I used a lot of pressure was when I was asking him to rear. Most of it was a liberty in a big pasture. At one point, I wanted him to do GOTM but he wanted to do front crunch. I stopped and let him to the crunch and respected his desire not to do the GOTM! Progress for me! I will try some of those rules for at least a little bit. I just got back from the barn after spending time on a sunny afternoon picking up horse manure. Let me tell you, the strangest thoughts come to me mind up there: As Blue was taking another dump I was thinking: impatience is catching it before it hits the ground, patience is waiting for it. No seriously, there was so many good thoughts in what you all wrote. It takes a while to process it all. So when we are doing things slowly, this is absolutely not because I am good at this suffering kind of patience that Leigh described so beautifully, but because by doing exactly what the horse needs, I AM getting closer to my main goal: the horse being in control and becoming stronger. It seems to help to formulate somewhat more general goals rather than very specific goals or goals within a time frame. My example from today is that I had it in my head to get certain things done around the house by 2pm, big mistake, I would have gotten so frustrated. Fortunately I was now aware of setting myself up for failure and decided to "go with the flow" and to make my only goal to spend the time doing worthwhile things. This led to taking a very nice, relaxed walk with my daughter and several of the dogs on a beautiful, sunny afternoon. All the chores (or at least some of the chores) can be done when it's dark. I know what makes me impatient is often the expection of doing something and then not getting it done. If I'm more careful with my expectations and think ahead of what might go different than my plan I can be much more patient. So much more to say, have to use the remaining daylight to do my outdoor chores. I just found another connection to this topic when I accidentally stumbled on the topic on "Defining pressure"
viewtopic.php?f=7&t=2233 which then continued into "Behavior, Cognition and Learning Theory"
It reminded me that in order to understand horse behavior and cognition we have to be willing to learn the horses' language through PATIENT observation. I'm taking baby steps to learn Spanish right now and it is definitely testing my patience to learn a new language. So here is one way that I can help myself to be more patient with my horse: When I feel frustrated about something that I can't get across to my horse I can think about the fact that the problem might be speaking her language clearly, not her lack of willingness to understand. If I made it my primary goal to speak "horse" rather than for to horse to perform certain movements right we'd both be happier with the progress. I have Jonathon my collie dog because God or the Universe decreed I needed the karmic patience lesson. Jon is too short, can be shouted and sound snappy, but Jonathon has to be sung....even when I have driven around and walked miles and spent 5 and sometimes more hours finding my boy. Relief at his return prompts " I'm so happy to see you, Thank you for coming back", with mega hugs, strokes, treats, cuddles. 5 years on and my dog usually comes to me without taking himself for more than the 5 miles a day exercise he gets in morning, lunch, tea-time and last thing at night rambles. I still am not allowed to raise my voice at politicians on television but maybe what they do is less important than I used to think it was, and I need to deal only with things I can influence. I naturally say please and thank you to horses, but when my darling husband carried sacks of feed from my car to the feed shed.....no I forgot to say "thank you", simply .."grrrr - I left those in the car because I have not got room to manage inside the feedbins without continually lifting things out of my way! ", but I probably meant " I love you and I am grateful for your consideration and effort on my behalf." I liked having a tack room of rossettes, I loved trophies. I am only less inclined to compete because it costs too much in transport, entry fees and I am getting too lazy to do all the preparation and fittening work. My horses are being brought on really slowly, either it is age+wisdom, and mature understanding, or I am becoming bone idle and satisfying myself with cuddle time versus achievement. I think the latter. 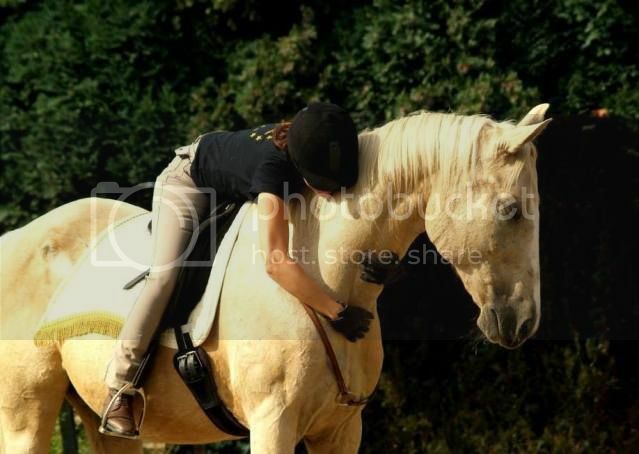 I think about competing again at times, then ask myself if that is the relationship I want with horses at all. Then I start questioning my reason for competing, and I'm not too proud of my motives since they turn out to be very self serving and pandering to my ego. THAT I don't need more of, but rather a good deal less of, thank you very much. Besides, it occurred to me quite some time ago to ask myself if people really DO admire a winner so much as do what is expected of them but in their heart have entirely different feelings. So there goes my ego boost when I stop to think about that, and it all comes down to, for me, the first question: what relationship do I want. And that answers it all. I'll give up accolades for my "great skills," in favor of a trusting nuzzle, and a sweet baby Bonnie kiss any day. In fact, I must be getting this worked out rather well, because Miss Aloof and Distant, Altea the mother mare, has taken to putting her nose by my face and getting her own kiss, sometimes. But more and more still and accepting. The world may keep its trophies. I have an old mare that is coming to tolerate, possibly even like me. And is possibly reading that I am getting right with my reason for being and for having horses in my life. The horse knows when we are congruent and righteous. And they count on it. So I guess being in the moment is different than patience. and saw the word invasive. I wonder --- do you think impatience is seen as invasiveness by some horses? It seems that the more comfortable a horse gets the more willing they are to respond to hidden agenda rather than impatience. That what we feel on the surface as impatience is actually more -- stamping our inner feet because our agenda isn't happening. (instead of - we are rushing because of lack of time) the former would be anger, yes? I bet they distinguish between different forms of impatience? Fine difference or me imagining things?